NASA astronaut Lee Morin '74 s talks with students about his many hours of walking in space. When Lee Morin ’74 first stepped onto the UNH campus as a freshman, NASA was only one year removed from its 1969 moon landing. Today, in the midst of a decorated career in service to the nation, the astronaut is charged with helping send humans farther into space than they’ve ever gone before as part of NASA’s Orion Mission. For his accomplishments to space exploration and more, Morin was honored as the 2017 College of Engineering and Physical Sciences (CEPS) Distinguished Alumni Award recipient during a ceremony held Sept.28. The CEPS Alumni Society gives the award annually in recognition of outstanding contributions to society with an emphasis placed on enhancing the image of UNH. “It is a great honor to have the university recognize me,” says Morin, who previously received the Granite State Award during the 2010 commencement ceremony. “When I come back to campus, it is always an emotional rush for me. UNH has a special place in my life. NASA astronaut Lee Morin is the 2017 recipient of the CEPS Distinguished Alumni Award. Following the award ceremony, Morin held two additional events on campus. He says the most rewarding part of the day was speaking with students. Morin says that the progress he’s witnessed in science and technology over his career has been reflected in the progress made on the UNH campus. He was delighted to see the campus has retained its character but also grown and expanded facilities to create more opportunities in what he called the golden era of engineering and technology. 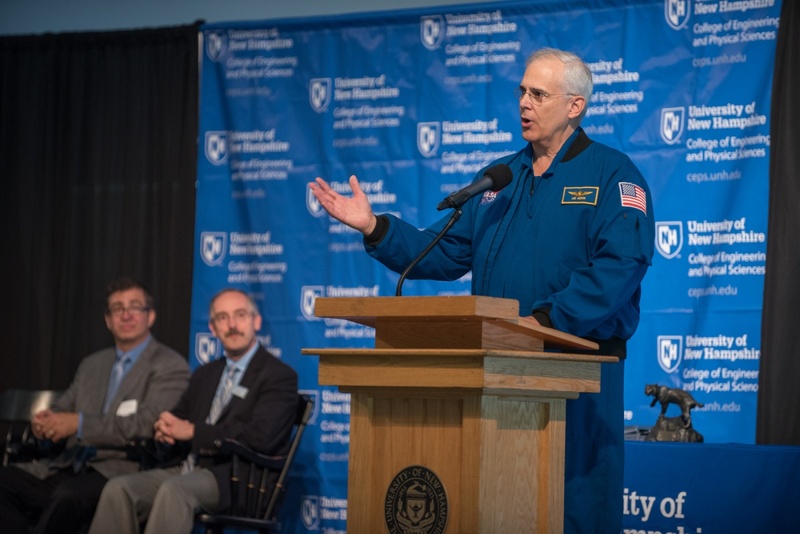 Though decades passed between graduation and his first journey to space in 2002, he credits his time at UNH in serving as a launching pad for his career. Morin worked on several research projects as an undergraduate student, including a laser project in the physics department, building a synthesizer in the electronic music studio and working on an offshore mining study through the math department. Following graduation from UNH, Morin attended New York University and received a Master of Science degree in biochemistry in 1978, a medical doctorate in 1981, and a doctorate in microbiology in 1982. He then served in the Navy for more than a decade before being selected as an astronaut candidate by NASA in 1996 and was later assigned to International Space Station training. He took his maiden voyage into space in 2002 on the spacewalking (EVA) crew of STS-110 and has spent more than 259 hours in space. Morin, who has logged more 14 spacewalk hours, is currently working on the cockpit of the Orion Multipurpose Crew Vehicle. Once completed, it is expected to carry the crew to space, provide emergency-abort capability, sustain the crew during the space travel and provide safe re-entry for deep space return velocities. Wayne Jones, dean of CEPS, says the college is fortunate to have graduates such as Morin who have been successful in a wide variety of career paths.